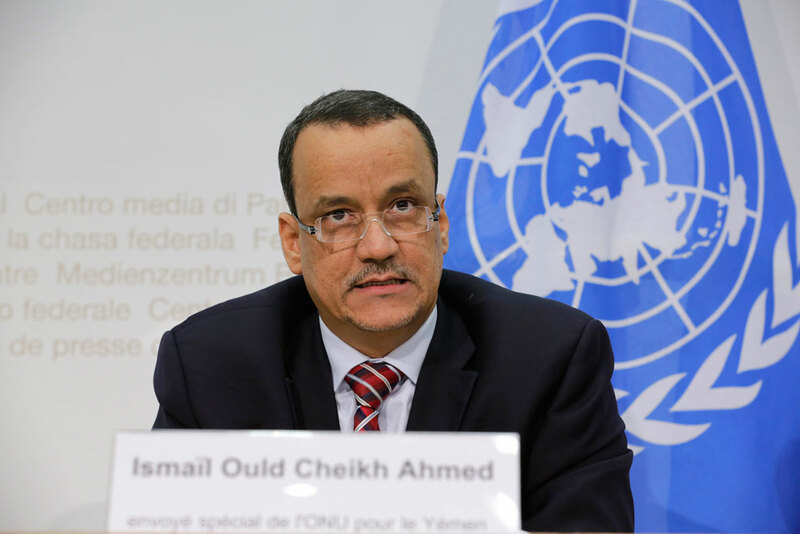 Riyadh, Aden- U.N. envoy for Yemen Ould Cheikh Ahmed is expected to head in the next few hours to the temporary Yemeni capital Aden, where he will meet with President Abedrabbo Mansour Hadi, who arrived at the southern city two days ago. Informed sources said on Sunday that the U.N. envoy will hold discussions to find solutions to the Yemeni crisis. Ould Cheikh will travel to Aden from Riyadh, where he arrived on Sunday coming from Muscat as part of his regional tour to reach an agreement between Yemen’s warring parties. The envoy’s new round of discussions will last up to 10 days for the purpose of reaching a final peace agreement. Yemen’s Foreign Minister Abdel Malek al-Mekhlafi said the U.N. envoy is expected to meet Hadi in Aden to receive the government’s response to his peace proposals. Sources at the Yemeni government confirmed that the Yemeni side would offer “strict” recommendations stipulating that no talks would resume before Ould Cheikh amends his roadmap for ending the conflict in Yemen. Yemen’s Deputy Minister for Human Rights Mohammed Mohsen Askar told Asharq Al-Awsat that the government will present to Ould Cheikh a letter including a list of remarks linked mainly to the envoy’s roadmap that abolishes the Gulf initiative, which limits the authorities and terms of the consensual transitional president. Askar said that the envoy’s roadmap contradicts previous U.N. resolutions on Yemen which stipulate that rebels withdraw from all cities after handing over their weapons to the state. However, he added, the roadmap of Ould Cheikh speaks about handing the rebels’ arms to an unknown third part that lacks any national, regional or international characteristic. While Yemeni sources confirmed that Ould Chiekh “had not met with any Yemeni government official during his visit to Riyadh,” a western diplomatic source told Agence France Press that the U.N. envoy held talks with western diplomats in the Saudi capital.